About two years ago, a dedicated group of volunteers founded the non-partisan organization called Fair Districts PA. The groups represented in this coalition were: Common Cause PA, the League of Women Voters of Pennsylvania, the Committee of Seventy, the Pennsylvania Council of Churches, and others concerned about accountable government. Fair Districts PA’s goal is to end gerrymandering in Pennsylvania by changing the way congressional and state legislative districts are drawn. The Fair Districts strategy has been to amend the PA Constitution, taking redistricting out of the hands of the state legislature and give it to an independent commission. This should take place in time for the redistricting that will take place after the 2020 Census. The first step was to propose to the legislature in Harrisburg to pass enabling legislation by June 30, 2018. Elected officials in 268 municipalities and 19 counties have adopted resolutions that ask their state legislators to support the enabling legislation. These elected officials, with both Republican and Democratic majorities, represent 6.9 million Pennsylvanians, about 54 percent of the state’s population. The 2021 redistricting will be carried out using the same process as in 2011. Whether controlled by Republicans or Democrats, the incentive to gerrymander districts to favor the party in power will still be in place. Despite bi-partisan support in the House and Senate, the PA legislature failed to pass the legislation. The bills were stalled in Republican controlled committees that refused to let the bills come up for a vote. Later the Republicans attached poison-pill amendments that assured the bills would never pass. Make all districts as equal in population as possible with an established minimal range of deviation. Respect city and county subdivisions, natural geographic features, and communities of interest. Not be drawn for the purpose of either favoring or discriminating against a political party or candidate. Meanwhile, the PA Supreme Court found that the districts in the Congressional map for Pennsylvania that were drawn in 2011 by the Republican-controlled legislature were not compact; did not minimize the splitting of city and county lines, and were distorted (gerrymandered) in ways that gave Republicans a disproportionate and unfair share of Congressional seats. The Court ordered the legislature to re-draw the Congressional district map by a specific deadline. When the legislature failed to comply with the Court order, the Court arranged to have experts re-draw the map. The new map was used in the primary last Spring and will be used for the elections this Fall on November 6th. 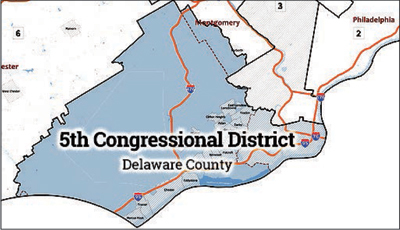 Prior to the new court-ordered map, Delaware County was divided between two Congressional districts. The First District included eastern Delaware County and parts of Philadelphia. Lansdowne was in this district, represented by Congressman Bob Brady, a Democrat. The western half of Delaware County was in the Seventh District, along with parts of Chester County, and was represented by Congressman Patrick Meehan, a Republican. Both Brady and Meehan decided not to run in 2018. Our new district, the PA Fifth, includes all of Delaware County, parts of South Philadelphia, and the Lower Merion part of Montgomery County. Mary Gay Scanlon is the Democratic candidate for the Fifth District; Pearl Kim is the Republican candidate for the Fifth. At the end of the legislative session in June, many of us thought we had lost our one opportunity to finally end gerrymandering in Pennsylvania. Even though the PA Supreme Court ordered the map re-drawn for this election cycle, no permanent change in PA’s method of redistricting was created. This means that in 2021, the redistricting that will be required after the 2020 Census will be carried out using the same process as in 2011. Whether controlled by Republicans or Democrats, the incentive to gerrymander districts to favor the party in power will still be in place. Promote an independent commission for Congressional districts only, not state legislative districts. This does not require a PA Constitutional amendment. Propose legislation to ensure transparency and public input for whatever map-drawing processes are used and to set enforceable standards for map-drawing. Continue the effort to amend the PA constitution to create an independent commission for state legislative and congressional districts in place for 2031, or possibly 2021 if unexplored ways to accomplish the goal sooner are identified. We have no assurance that the lines drawn for the PA Fifth District will still be in place after 2021. Groups like Fair Districts PA will continue their work to end gerrymandering in PA. In the meantime, be sure you know what position your state representative and your state senator have about working to end gerrymandering.